An important and extraordinary work of art circa 1925 by Madame Babani, a contemporary of both Mariano Fortuny and Maria Gallenga. Babani was most known for her embroidered Asian influenced themes and designs which are prominently featured in this ensemble. It is quite rare to come across a Babani embroidered textile of this magnitude and as a matching ensemble. The elaborate rare embroidery of this artist is most reflected in these pieces and for that reason makes them important pieces for collectors or museums. They are also very wearable and make a unique and entrance making evening ensemble. Both pieces are great examples of Japonism in this circa 1925 2-piece work of art. 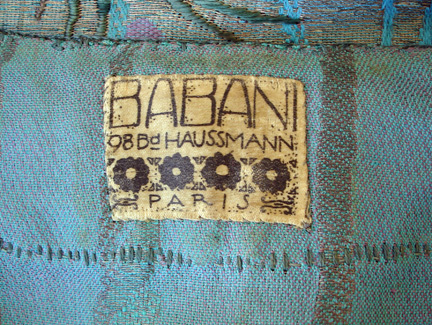 As a disciple of Fortuny, Madame Babani maintained a prominent Paris shop in the 1920's. Her garments have been compared to Fortuny's as she too designed tunics, jackets dresses, etc. 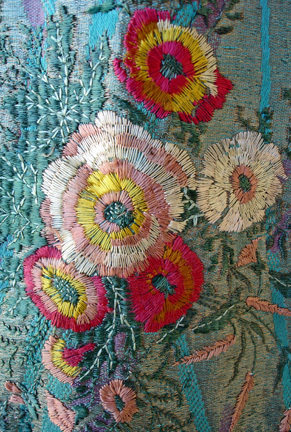 What differentiated her from Fortuny is that she utilized brighter embroidered fabrics and favored the Japanese influence. 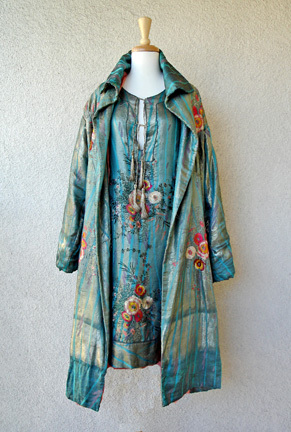 This is prominently and visibly displayed in this extraordinary Babani embroidered dress and matching coat. 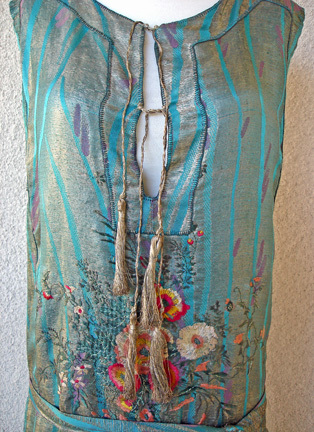 1920's chemise style dress fashioned of turquoise, purple and silver lame in a Japanese inspired floral motif hand embroidered with multi-colored silk bouquets. The closures consist of burnished silver tassels. 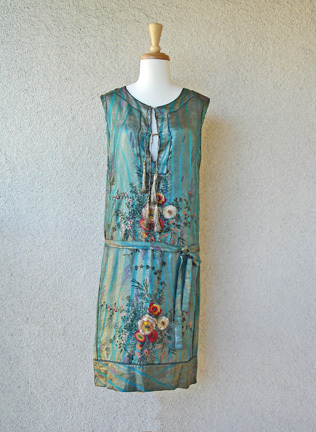 Includes matching belt which can be worn at the waist in the 1920's fashion of the period or not. 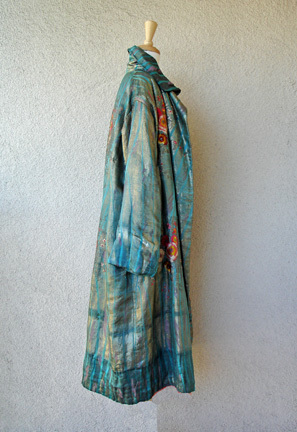 This dress was exhibited in The Shapes of Fashion Exhibition sponsored by The Fashion Foundation of Japan 1993.
dress: bust: to 38"; waist: 36"; hips: 38": length: 42"
Condition: excellent with no wear. Babani label in dress only. 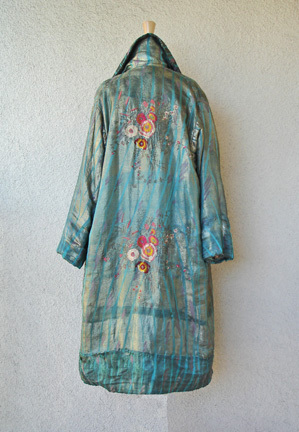 It's matching full length hand embroidered coat is spectacular! Fashioned in identical fabric to that of the dress. Loose swing style coat with standup collar and slightly wide sleeves. Coat is also slightly padded for warmth. An incredible, stylish, lavish entrance evening coat from the mid-1920's! coat: size: one size will fit most; bust: to approx. 46"; length: approx. 46"; shoulder: 17"; sleeve: 23"
Both pieces are exceptional and can be worn together or separately in a variety of ways.